I've really been thinking a lot lately how adverse circumstances such as those the state of Texas has endured for the last couple of weeks (and which Florida looks like it is going to experience this weekend) present such great opportunities for us Christians to do Kingdom work and exhibit the glory of God. Yet what does that really look like to us Americans? From what I hear in testimonies from those [in other countries] who have received a mandate to teach on the freedom and power of Jesus in our lives, and the command to "release and establish" the sons and daughters of YHWH "to build His house, the hiding place of HIS glory", I wonder if we here in America are even capable of comprehending the spirit and the truth of this vision. It seems to me that we are so entrenched in our own idea of who God is, and what God wants us to be and do, that we don't even seek His face or listen for His instructions, let alone know Him. The whole earth was once the exclusive realm and glory of the Father until Adam and Eve relinquished it to the Enemy in a moment of pride and selfish desire. The devil knew this when he offered it to Jesus in Luke 4:6 ... And the devil said to Him, “I will give You all this realm and its glory [its power, its renown]; because it has been handed over to me, and I give it to whomever I wish. Jesus came to reclaim this glory realm for the Kingdom of Heaven, offering us eternal salvation in the process of partnering with Him to take back God's territory. And the result? Lamentations 3:24 says it all: The Lord is my portion and my inheritance,” says my soul; Therefore I have hope in Him and wait expectantly for Him. But I think it is important to understand two things if we are going to ever experience the fulfillment of this hope: 1) what and how do we encounter the glory realm, and 2) what does it mean, "the Lord is my portion"? Let's try to answer proposition number one... God has a purpose for each of our lives, and at the center of that purpose is His desire that it glorify Him. In whatever manner we are called to serve Him, He wants our efforts to include relationship with Him. But do we Christians even know what that means? How do you have a relationship with the One who created you, yet you don't really know Him? I can tell you that it is more than attending Church every Sunday. It is more than what you tithe. It is more than what denomination or doctrine with which you identify. It is personal. It is seeking His presence. And it is hearing His voice, and actually being in His presence. His realm is where He is, and there you will find His glory. He wants you to look into His eyes and have conversations with Him. He wants you to ask Him questions and to receive His answers. But here's the thing ... we have to want to do that; to go beyond what our Western Christian culture tells us "relationship" looks like. Let me ask you this: the Bible shows us great examples of the relationship we can have with God. Consider the relationship Abraham had with Him; or Moses, Joshua, Isaiah, Jeremiah, Peter, John or Paul, among many others. Does yours look like that? Do you discuss things with Him, even argue with Him? Do you cry out to Him, and expect to hear from Him? And if you do, are you obedient? Or are you content with an impersonal connection through association with a Church body? Let me share what God revealed to Heidi Baker, a Christian missionary, and author on Christian spirituality... She once asked the Lord, "I know your Word says that we're sons and daughters already. So why all the groaning? What are we waiting for?" He responded, "You know those orphaned children you take home with you [to the mission in Mozambique]?" "Yes, Lord." "They have to want to come. Some want to. Some don't know the opportunity is available to them. But others, even though they know they're welcome in the house, prefer to stay outside." Heidi Baker goes on to explain ... "As Christians, we're like those children. We're all welcome to move in the authority of sons and daughters, living in the realm of glory, seated with Christ in heavenly places. But we must want to come. We must never doubt that there is nothing He can't or won't do for those who believe--for those who step into their places as sons and daughters of God. Jesus never doubted His Father for a moment. When Jesus took the bread and fish in His hands (Matt. 14:19), He knew, without question, that as He gave thanks to the Father, there would be enough to feed the multitudes. He didn't look at the five loaves and the two fish. He looked into the eyes of the hungry, and He looked into His Father's eyes. He said, "Thank you, Father," and He proceeded to feed more than 5,000 men, women and children. God wants us to be like Jesus feeding the five thousand. He wants us to move in the fullness of Christ, fully yielded to Him. He wants us to walk as His sons and daughters in the earth. He wants us to look into His eyes—and into the eyes of a world that desperately needs His love. The whole creation is waiting for us to step into the realm of supernatural glory He has prepared for us. It needs to see and experience God's love through us. What are we waiting for"? I don't think I've ever heard anyone explain what that glory realm on earth would look like better than that! And if we could ever step into our rightful place in that realm of glory -- that place where we meet with God and experience His glory -- then the Lord would be our portion, and it would be enough. 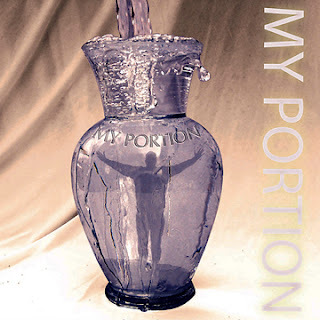 And that brings me to my second point ... what does it mean to have the Lord as our portion? According to Strong's Concordance, "portion" is usually associated with "territory", and it can have a variety of meanings, depending on what you have a "portion of". If it's a meal, then your portion is your share of the food. If it refers to war, then it is your share of the plunder, or your "booty". If it's your inheritance, then it refers to what has been allotted to you. And when the Lord is your portion, it refers to a spiritual "possession" or blessing. So, if God's realm is the territory where He is, and you have that kind of personal relationship in which you commune with Him and enjoy His glory and His presence, then your portion of spiritual territory is God Himself! No matter what happens in this physical realm, your portion, or territory, is a place that shelters you from everything this world throws at you -- whether trial, tragedy, or treachery. In fact, we aren't even to look around this earth to discover our portion of the Lord. Our portion of Him is not on this earth... we are here for such a short time, and our inheritance from the Lord is far greater than whatever this world has to offer. So, let the unbelievers and the wicked inherit the riches of this realm called earth. For me, I will receive my allotment -- my share -- my inheritance -- my portion of Him in the spiritual realm where His glory resides and I get to experience it every time I look into His eyes and see His love. I am ready to see this territory called earth proclaimed as His realm of Glory and for every faithful Christian to receive their full portion of inheritance as a son or daughter of the Kingdom. It is time we truly honor Him and each other as we seek to fill the positions to which He has appointed us. If you don't know what that position is, or what your portion is, then it is time to seek His face and take your place in the Body. Simply filling a space in the pew on Sunday doesn't establish the True Church; the ones who are called out of the world and who will take the responsibility to see His Kingdom come on earth; the ones who are willing to do the work to reconcile mankind with the Father and return everything that belongs to Him, back to Him. I guess I'm just ready to see the Body of Christ grow up and into the image of our holy Redeemer. May His Glory Realm become my full portion! Psalm 73:26 My flesh and my heart may fail, but God is the rock and strength of my heart and my portion forever. This is very interesting. Over the last few years I have been establishing a deeper and deeper relationship with God, and I often wonder what others relationships with Him look like. I am now at the point where my relationship with my Father is dynamic. He is a very loving Father, but He also can be angry at me, disappointed in me, and He can take my sarcasm better than most people. It took me a while to understand that no matter what I do His love never changes. Even when I don't do what He says the first time and He gets angry I never doubt His love for me. I have just a little different view of God than you do... I do not believe that God gets angry at those who belong to Him. He is always for us, and never against us. Yes, I believe He gets disappointed, and He will correct us and discipline us when we stray from His path. But you are right, His love never wavers and He is always with us... just a conversation away. All we have to do is seek Him, and He will answer.